CC was the queen of the Key Largo Dolphin Tournament ... what ended up making this tournament so incredible was the fact that one team ceded the opportunity to win when they spotted nine people floating in 180 feet of water after their raft -- bound for Florida from Cuba -- overturned. Captain Las Oliva of Miami and his teammates Ida Nachman forfeited the tournament to save lives. The irony of it all - Carol , Academy Award, singer, songwriter, who co-wrote the theme song for Rocky, and most recently the lyrics for Roman Polanski's masterpiece "The Pianist", opened the Tournament with "America The Beautiful" and as she said America is truly beautiful , and then performed the song she wrote Largo - "Key Largo Blessed By the Sea" and on this day nine lives were saved. They were out there since Thursday! They were truly blessed by the sea off of Key Largo. 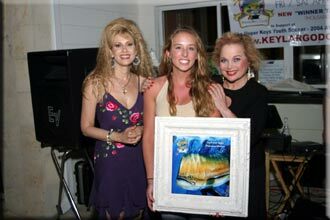 CC, Jackie & "Humphrey Bogart"
On April 23rd and 24th Carol and her friend Rhonda Shear appeared at the 13th Annual Key Largo Dolphin Tournament and they were a BIG hit! Here CC (r) and Rhonda (l) are shown congratulating a proud winner.